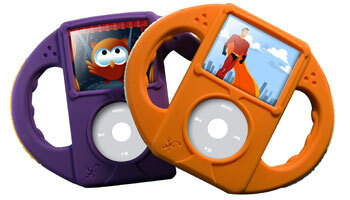 ifrogz has introduced the Tadpole, a new line of video iPod cases made specifically for children ages one and up. The Tadpole is designed to provide a way to let even very young children use iPods. The cases are engineered with two large handles that not only help children maintain a solid grip on the iPod, but also provide additional protection for the device. Measuring 5.5-inches wide, 4.25-inches high, 0.75-inches thick and weighing 2.7 ounces, the Tadpole provides protection without adding significant bulk. The manufacturer‚Äôs suggested retail price is only $24.99. The Tadpole will begin shipping in early December 2006.